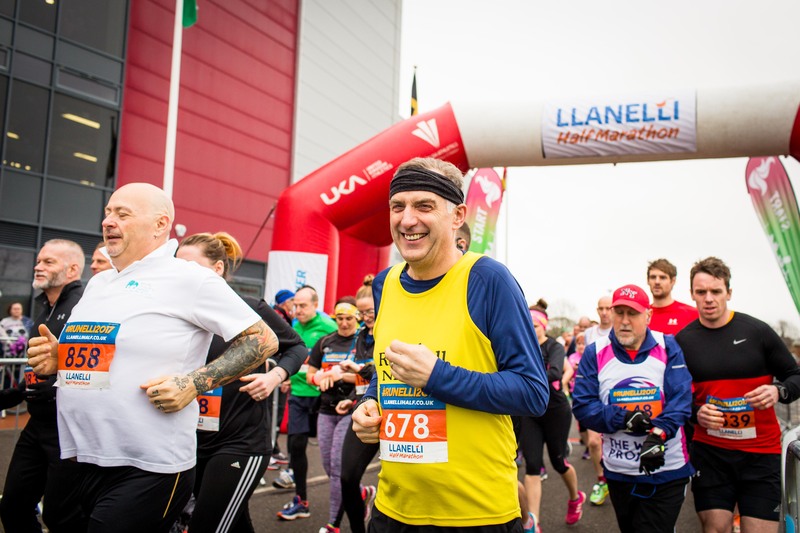 The second edition of the Llanelli Half Marathon (Sunday 18th February) since Front Runner Events took over the race was an overwhelming success with a record amount of runners taking on the 13.1 mile sold out race. The fast, flat course attracted runners in their droves as this year’s race almost doubled in size, with a record field of athletes of all levels taking part. There were; first-timers, charity runners, club runners and a strong elite field, making it clear to see why the race has recently been shortlisted in the Best Half Marathon (<5000 runners) category at the UK Running Awards (held on April 19th). The half marathon started at Parc Y Scarlets before heading out on fully closed roads and taking in some spectacular views of the Loughor Estuary from the Millennium Coastal Path. Hundreds of spectators came out to support the runners at the start line, across the entirety of the course, as well as cheering them in across the finish line. There was a strong men’s field attracting runners from across the UK. The title was claimed by Matthew Clowes of Cardiff AAC with an extremely impressive time of 01:05:14, beating the course record by 4 seconds. Andrew Davies of Stockport Harriers was only just behind him in a time of 01:07:42, shortly followed by Joe Beech from Brackla Harriers in a time of 01:11:55. The women’s course record was broken by 7 minutes by Caryl Jones of Swansea Harriers with an impressive time of 01:14:21. Closely followed by Clara Evans of Cardiff AAC in a time of 01:16:55 and third place went to Natasha Cockram of Micky Morris Racing Team with a time of 01:17:52. Local running clubs provided a team of race pacers helping many runners achieve their PB and hitting their target time on the day. The fully marshalled race on closed roads included water stops (thanks to Hydration Partners, Brecon Carreg), energy gels, bespoke medal and goody bag delighted all race finishers. Runners were also able to benefit from a pre/post-race massage from Gary Howells and Gower College Swansea. The winning team of the 2018 Corporate Challenge went to South Wales Police with an average combined winning time of 01:36:39, and were amongst teams from Gomer Williams, St John Lloyd, Castell Howell and S5 North Europe. “We are absolutely delighted to have almost doubled the number of runners from 2017 to 2018. It’s fantastic to see the response we have received not only from local runners but from runners further afield. With a strong elite field for 2018 we knew there would be tough competition for last year’s winners, Josh Griffiths and Carys-Mai Hughes, and we are absolutely thrilled that both records have been beaten by Matthew Clowes and Caryl Jones. I would like to thank each and everyone of our 180 or so volunteers who have helped us create a special day. Without the help of the volunteers it would be far more difficult for us to hold events such as this. 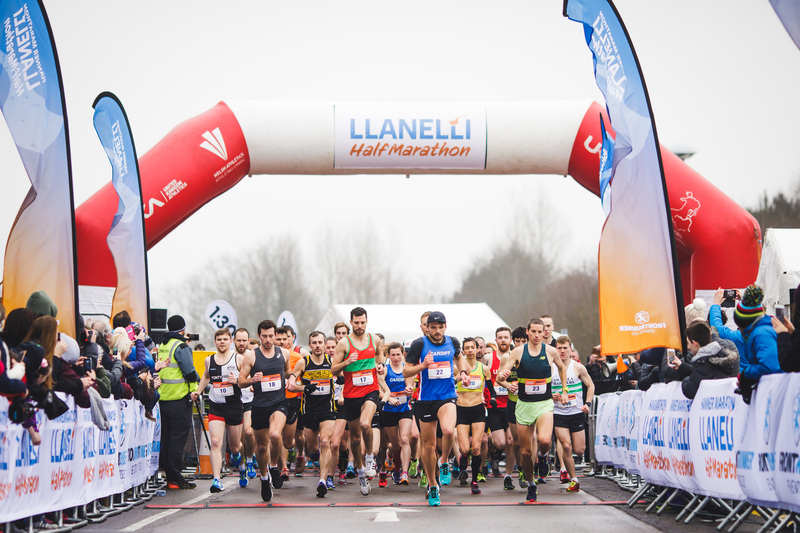 The organisers are currently confirming the date for the 2019 Llanelli Half Marathon; however, it will definitely take place in February once again. Registration is already open and people can sign up to #RunElli via the website. Standard entry fee for the 2019 race is £30 (+booking fee), or £28 (+booking fee) for affiliated runners. Go to www.llanellihalf.co.uk for further details, full results and to sign up to the 2019 race. You can also like the Facebook page www.facebook.com/llanellihalf/ and follow @LlanelliHalf #RunElli on Twitter.